Sky survey: The telescope we use (Arecibo Observatory) scans across the sky, searching for signals everywhere. This differs from a directed SETI search, in which the telescope examines a few stars carefully. Microsecond: A millionth of a second. Astropulse is better than previous searches at detecting signals that last for a very short length of time. The shorter the signal, the better Astropulse is at detecting it, to a lower limit of 0.4 microseconds. Astropulse can detect signals shorter than 0.4 microseconds, it just stops getting better and better in comparison to other searches. Radio: The signals are made of the same type of electromagnetic radiation that an AM or FM radio detects. (Actually of substantially higher frequency than that, but still considered "radio.") Electromagnetic radiation includes radio waves, microwaves, infrared light, visible light, ultraviolet light, x-rays, and gamma rays. Click here for more information on electromagnetic radiation. In this plot, the x-axis is time, and the y-axis is frequency. 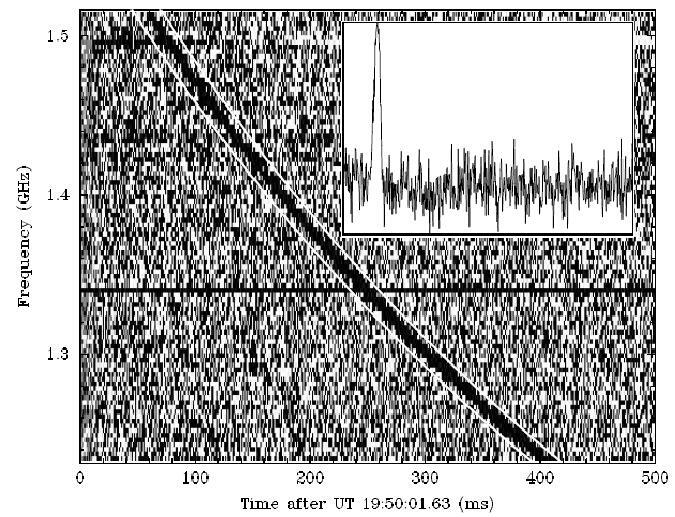 This plot shows that the frequency of the pulse decreased over time, which is exactly what we would expect from a dispersed pulse. See the dispersed pulses section for more. ET: Previous searches have looked for extraterrestrial communications in the form of narrow-band signals, analogous to our own radio stations. Since we know nothing about how ET might communicate, this might be a bit closed-minded. Pulsars and RRATs: Pulsars are rotating neutron stars that can produce signals as short as 100 microseconds, although typically much longer. 0.4 microseconds seems like a stretch. Astropulse is capable of detecting pulsars, but is unlikely to find any new ones. RRATs are a recently discovered pulsar variant. Perhaps Astropulse will discover a new type of rotating neutron star with a very short duty cycle. Exploding primordial black holes: Martin Rees has theorized that a black hole, exploding via Hawking radiation, might produce a signal that's detectable in the radio. Click here to learn about black holes. Extragalactic pulses: Some scientists recently saw a single transient radio pulse from far outside the Milky Way galaxy. No one knows what caused it, but perhaps there are more of them for Astropulse to find. New phenomena: Perhaps the most likely result is that we will discover some unknown astrophysical phenomenon. Any time an astronomer looks at the sky in a new way, he or she may see a new phenomenon, whether it be a type of star, explosion, galaxy, or something else. In order to see the signal's true shape, we have to undo this dispersion. That is, we must dedisperse the signal. Dedispersion is the primary purpose of the Astropulse algorithm. The amount of dispersion depends on the amount of ISM plasma between the Earth and the source of the pulse. The dispersion measure (DM) tells us how much plasma there is. DM is measured in "parsecs per centimeter cubed", which is written pc cm-3. To get the DM, multiply the distance to the source of the signal (in parsecs) by the electron density in electrons per cubic centimeter. A parsec is about 3 light years. So if a source is 2 parsecs away, and the space between the Earth and that source is filled with plasma, with 3 free electrons per cubic centimeter, then that's 6 pc cm-3. The actual density of free electrons in the ISM is about 0.03 per cubic centimeter. At the end of each small and large DM chunk, Astropulse performs the Fast Folding Algorithm. This algorithm checks for repeating pulses over a certain range of periods. (The period is the length of time after which the pulse repeats.) When the fast folding algorithm is performed after each large DM chunk, it searches over an entire 13 second workunit, and looks for repeating signals with a period of 256 times the sample rate (256 * 0.4 microseconds) or more. When the FFA is performed after each small DM chunk, it searches over a small fraction of the workunit, and looks for repeating signals with a period of 16 times the sample rate or more.